Add a Classic Disney Moment to Your Collection with this Mickey’s Delayed Date 1 oz. Silver Proof! All around the world people are familiar with Mickey Mouse and his numerous classic moments in Disney films. 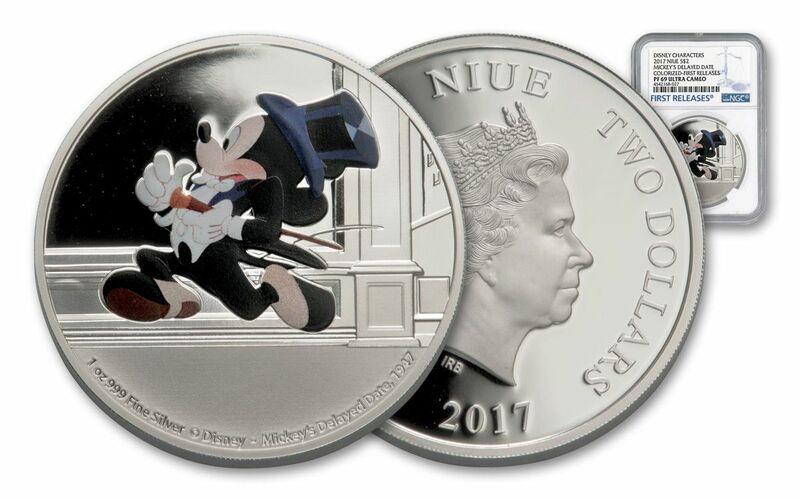 This Silver Proof issued by Niue is from the Mickey Through the Ages series, which features Mickey in some of his most recognizable roles over the years. Colorized Design – Mickey actually looks like a cartoon! This 1 oz. Silver Proof was struck by the New Zealand Mint. Made of .999 fine Silver, it features the Mickey’s Delayed Date design. It is the sixth design of the series. This film was released in 1947. The plot revolves around Mickey, Minnie, and Pluto as Mickey hurries to meet Minnie at the dance. As you can see, this coin was made just for collectors. Its maximum mintage was set at just 10,000 pieces. This figure is quite small compared to the worldwide number of Disney fans. Portions of this Proof have been colorized. This only adds to the overall presentation. Mickey and his colorized cartoon appearance shine through and look great against the Silver background. The obverse features Ian Rank-Broadley’s effigy of Queen Elizabeth II. The issuing country, face value, and date are here as well. On the reverse, the colorized Mickey’s Delayed Date design is shown. He is in quite a hurry, both of his feet are even in mid-air! Since this is an officially licensed Disney collectible, the copyright information is inscribed here. The Silver content is just to the left of the copyright. The Numismatic Guaranty Corporation, NGC, graded this coin. This specimen is almost completely free of flaws, any that are present are very minor. It was awarded the grade of Proof 69 for its condition. The First Releases designation was given for being submitted during its first 30 days of issue. The Ultra Cameo designation is for coins with stunning visual contrast. 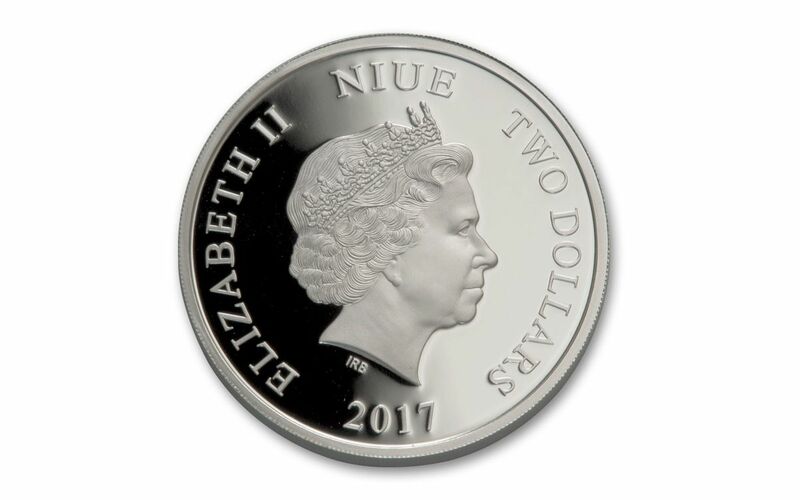 This 2017 Niue 1 oz. 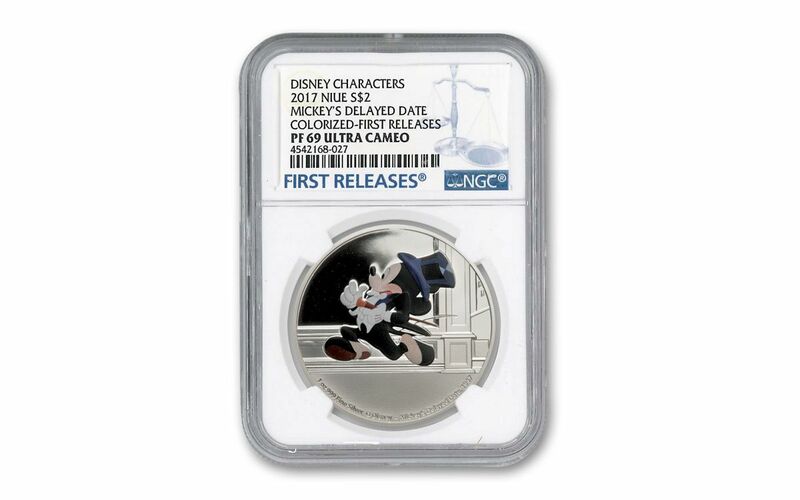 Mickey’s Delayed Date colorized Silver Proof is protected by a permanently sealed NGC slab. However, it also comes with its original Mint packaging and certificate of authenticity. The certificate is individually numbered and the original packaging has Disney designs. The outer box shows Mickey and Pluto during a moment from the film. Order your NGC PF69 UC FR 2017 Niue Mickey Through the Ages 1 oz. 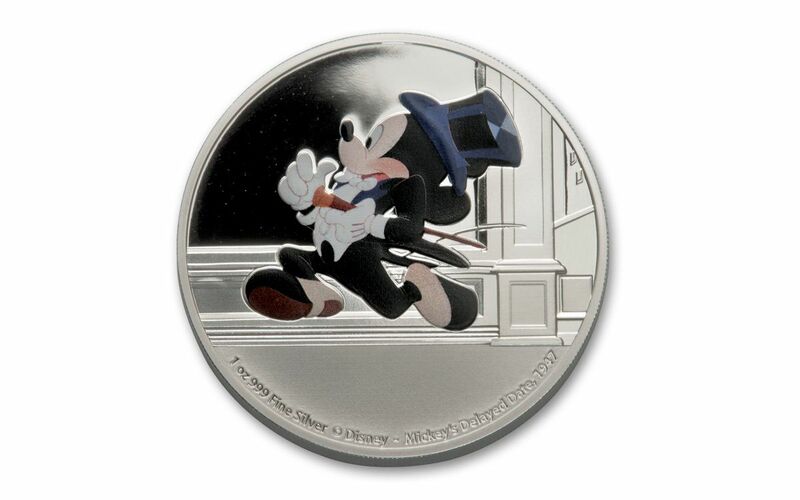 colorized Mickey’s Delayed Date Silver Proof from GovMint.com while you can!